I am pairing an Arduino Uno along with both a HC-05 bluetooth module and a sensor circuit. Show below is the circuit conditions as well as the circuit. As far as powering up the system, I am planning to use a 9 Volt battery(550 ampere) to connect to the Arduino which draws in 45 mA and the sensor circuit which takes in a total of 28 mA. I calculated the total life of one of the batteries to be 7.53 hours by (550/(28+45)). Can someone help me with the total power consumed by the system? 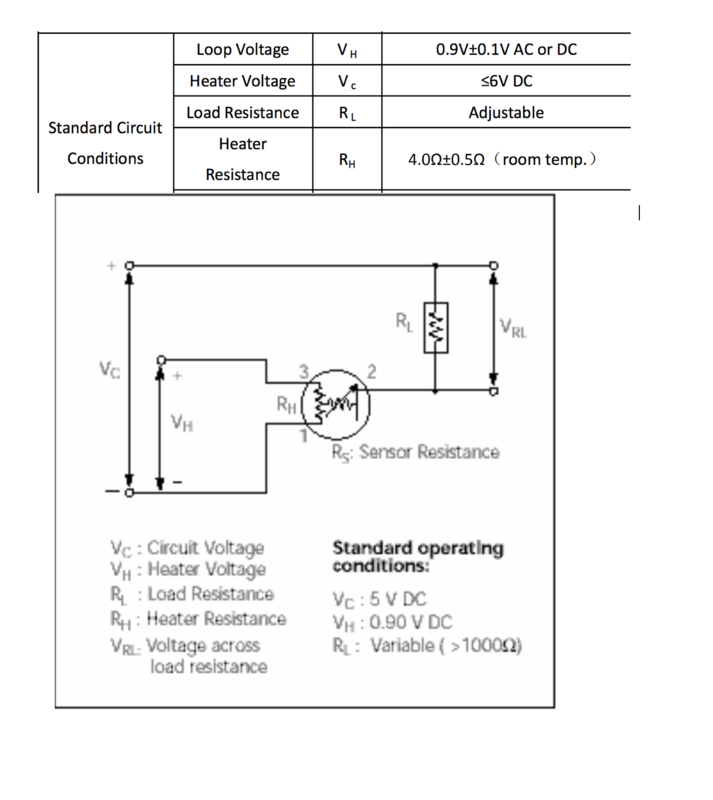 UPDATE: I read on the sensor data sheet that there are two parameters which heater power as well as sensor consumption. Heater Power consumers approximately 140 mW and the sensor consumes approximately 10 mW. I believe the Arduino will consume 405 mW because of (9 volts * 45 mA) and the bluetooth module will consume 26.5 mW because (3.3 volts * 8). Therefore, the total power consumption is 571.5 mW. Is this correct??? Also will the 9 volt battery be able to support the total power? Your calculations are not totally right. I did not check the data you provided, so I'm just using the numbers you put. The arduino draws up 45mA @5V. The sensor has a power of 150 mW and is powered at 5V, which means a current of 30mA. The bluetooth module gets 8mA (are you really sure? it seems too low) @3.3V. Now, the battery gives you 9V. So you need to convert them to the proper (5V and 3.3V) voltages required by the devices. Total current = 45mA + 30mA + 8mA = 83mA. Please note that if using a 9V battery, the 5V regulator will need to dissipate (9-5) * 83mA = 332mW of power (or slightly less if the 3.3V regulator directly interfaces to the 9V battery). Now, according to the first datasheet I stumbled upon on google, this kind of battery have a capacity rated at 10mA, but at 100mA it loses about 40% of it. In fact, batteries tend to last less when the current increases (if you double the current you will get less than half of the time). Now, if you use a switching regulator to get 5V from the 9V (and then a linear one to get the 3.3V), you will have to generate 83mA at 5V. This means that, considering an efficiency of 85%, your battery will have to provide roughly 54mA (83mA*5V/9V/85%). According to the datasheet of the battery, this lower current reduces the degradation of the capacity to about 25%. The total uptime is consequently 7 hours and a half (550mAh*75%/54mA). Total current from battery: 53.4mA (which can be considered equal to the case with just one switching converter. Not the answer you're looking for? Browse other questions tagged arduino-uno sensors power hc-05 or ask your own question.